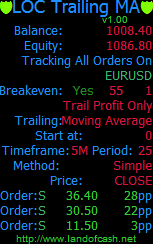 LOCTrailingMA is a Moving Average (MA) based order trailing expert advisor (EA) with a breakeven functionality. LOCTrailingMA expert advisor will automatically trail your opened positions using Moving Average indicator. Also it allows you to specify a breakeven level to automatically move your stop loss in a breakeven after a certain pips of profit. EA can be configured to track all opened orders on a pair or only those which are marked with a special comment. How this expert advisor works. 3. EA moves the SL value in your favor with the selected MA settings. And start trail using 14 period Moving Average. Customizable input parameters of the indicators used. Can move SL only in profit area or instantly after an order was placed. Can set Stoploss and Takeprofit instantly after an order is placed.